Rule #6: Never miss an opportunity to learn something new. Although we choose a cruise holiday for a relaxing way to visit new places while being waited on hand and foot, any cruise you might consider taking is also a wonderful opportunity to actually learn something new. A relatively new phenomenon in the cruise industry, hands-on cooking classes are available on only a handful of ships on only two cruise lines that we know about at this point. Oceania cruises pioneered this approach and evidently – although we haven’t experienced this since we haven’t sailed on HAL for some years – Holland America now offers this experience on several of its ships. Oceania offers this to groups of 24 lucky guests who register early enough on their two larger ships: the Marina and the Riviera. And we have taken classes on both. The chef instructor’s demonstration counter with overhead cameras and two viewing screens so that we could see everything she was doing. We had no idea what to expect that first morning when we arrived in the cooking school to don our chef’s hats and aprons; we only knew that we were looking forward to that class on French Classics. Led by chef instructor Noelle Barille, we along with eleven other teams of two, were instructed in some of the fine points of classic French cooking and we were able to actually make several ourselves including classic haricots verts with shallots to accompany the Jacques Pepin roasted chicken, and classic quiche Lorraine. Later on that cruise we took a class on wok cooking and a brunch class. What set this experience apart from others we’ve had on cruise ships was the sheer amount of organization and precise execution that was on show. The chef was assisted by two sous chefs and a kitchen worker who was responsible for cleaning up everything after us. Each time we were called to the front to observe the chef’s demonstration, when we returned to our stations (complete with individual work counters, sinks, cooking implements and induction cook-tops) the mise en place dishes were all lined up for us – pre-measured ingredients to facilitate the cooking process without wasting time to measure everything. Although to be truthful, it’s a prep technique that we took to heart and employ almost all the time at home now! The chef herself was personable, extremely knowledgeable and entertaining – all important qualities for this kind of class. The experience was so useful – and the recipes so good that they are now in our permanent repertoire at home – that a few months ago aboard the Riviera we took three more such classes. We were a bit nervous since that first time had been so good. The new chef instructor Karlis Celms was on his very first contract doing this and he had a hard act to follow. But follow it in good form he did! We enjoyed the three classes we took that time just as much (Asian cooking including a sushi experience, and two Italian-related ones including pasta-making). The $60-70.00 per person or so we paid for these courses was worth every single penny. We’re not planning another Oceania cruise in the immediate future (we’re booked back on Silversea for South America and the Panama Canal next year), but if we ever do, we’ll be back in the kitchen. Bon voyage to new learning experiences! Like most people, we travel for a variety of reasons. Sometimes we travel to visit family and friends far away; mostly we travel to experience new and exciting places and cultures. However, from time to time we travel simply for an opportunity to relax, and there is nowhere better to relax than places we know and love for their laid-back ambience. For us that laid-back ambience is exemplified nowhere better than the Caribbean – and the most relaxing way for us to visit islands we know and love is on a cruise line that we also know and love. We’re just back from three weeks doing just that, and it was just what the doctor ordered. Leaving behind a snowy Toronto (oddly that day it did snow although the winter, by and large, has had very little of the white stuff), we waited with sixteen aircraft in front of our plane for the inevitable de-icing that characterizes any kind of air travel in a Canadian winter, then waited in an equally long line-up to take off. But it was worth it. After six days in Miami Beach (we’ll tell you about that and South Beach’s art deco history in the next few weeks) we boarded our transportation that would take us back to islands we’ve visited many times in the past. 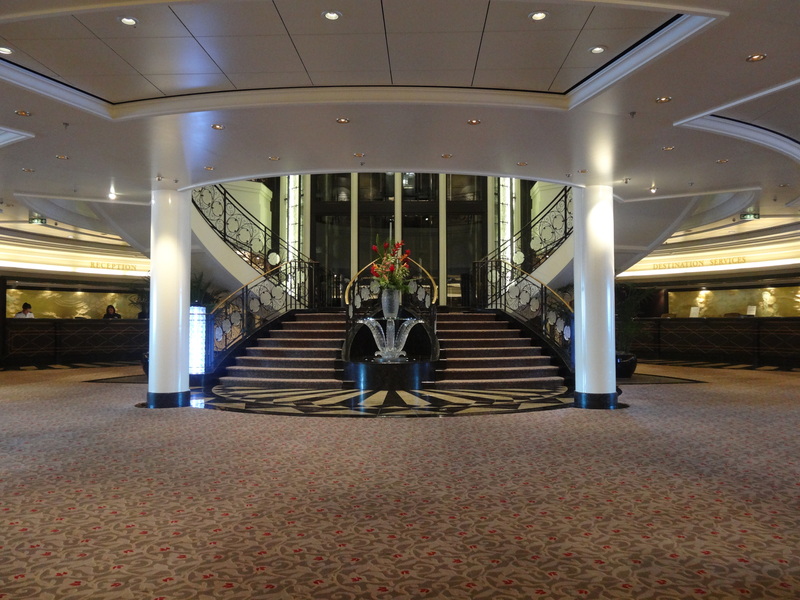 That transportation for this trip was Oceania’s Riviera, an elegant and quiet 1200-passenger beauty. We were bound south and planned to enjoy each of the stops on our own terms – NO shore excursions with gaggles of other people! A view of part of the Atlantis Resort on Paradise Island from one of the two bridges that connects it with Nassau. Our first stop was Nassau in the Bahamas where we’ve been many times over a period of some thirty years. Not strictly speaking in the Caribbean – it’s the Atlantic really – Nassau has changed over the years. We took a long walk from the cruise pier through the main street of Nassau and over the bridge to Paradise Island. The first time we visited that little island it was dotted with small resort properties like a Holiday Inn and Flagler Hotel, not to mention Club Med in more recent years. Now, however, it’s been gobbled up by Atlantis, where we have actually spent a week-long vacation in the past, one of the most expensive for this kind of vacation for us. The Atlantis complex has practically taken over the island these days. Back over the bridge, we visited the well-known straw market to find that it has disappointedly changed with hand-made straw products vastly outnumbered by trinkets and T-shirts imported from Asia. And not a single local woman actually making a basket on the premises. Pity. Next stop was Gustavia in St. Barth’s. The last time we were there we toured the island; this visit we confined ourselves to exploring the town of Gustavia. A little bit of France in the Caribbean, Gustavia is home to a variety of the best-loved high-end French brands. But we were on a mission to visit the French Pharmacie so that Patty could purchase several French drug-store products that you can’t buy elsewhere. Stuffed to overflowing with brands like LaRoche Posay, Emryolisse, Bioderma, Vichy, Nuxe and Caudalie to name only a few, a French Pharmacie is nothing like drug stores in North America and always worth a visit! When we arrived in St. John’s, Antigua, we were looking forward to revisiting an island we had spent a vacation on a few years go and that we loved. Unfortunately, it was crawling with cruise ship passengers from several mega-ships and we gave the town short shrift noting that some aspects seem to have deteriorated since our last visit. We then arrived on the scene of our honeymoon some 28 years ago: the island of St. Lucia. The last time we visited the island about four years ago, we took an island tour and noted that Castries, the capital seemed as down-trodden as ever. We were pleasantly surprised on this visit to see that St. Lucia seems to have weathered the recession better than some other islands. The town was vibrant, hopping and wonderfully hot. St. Maarten was our last island visit. Having spent several wonderful holidays here before, we were looking forward to our early-morning stroll along the boardwalk in Phillipsburg. Morning is the very best time to do this since most people on cruise ships are off on those shore excursions and won’t return to town until later in the afternoon. So we had it all to ourselves. A quick pop into the Flip-Flop shop where Patty always buys her flip-flops and then we were back to the ship. In spite of this being a kind of return for us – no surprises to speak of – there is still much to tell you about. Stay tuned as we tell you stories about learning new skills while on vacation, Art Deco architecture in South Beach including the Blue Moon Hotel where we stayed, and how we plan independent cruise port visits – eschewing those cattle calls they refer to as shore excursions. 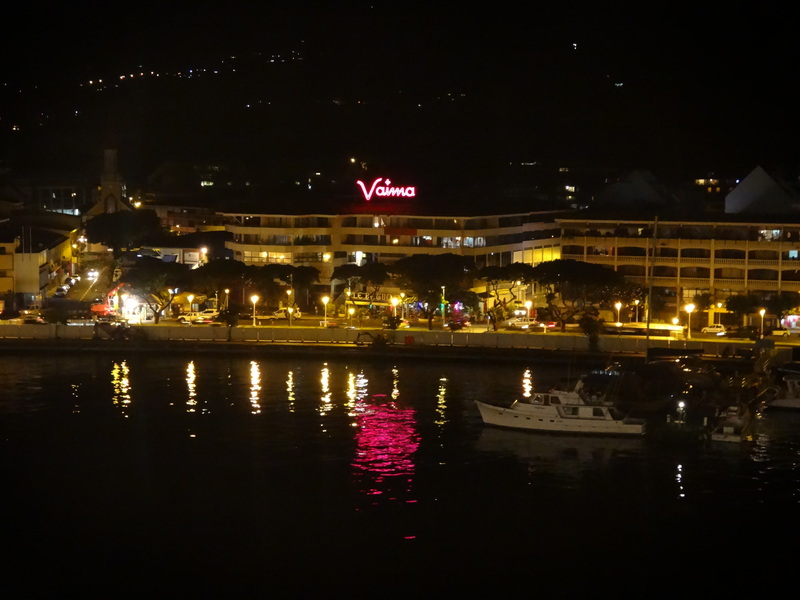 We left Papeete at 10 pm one hot, sticky February night. Over the years we’ve observed that there are only two kinds of travelers who scoff at the notion that cruise travel could be a wonderful way to see the world. They fall into one of the following two categories: those who have never been on a cruise, and those who have been on one and chose the wrong (for them) cruise line. The truth is that we’ve actually seen converts to cruise travel, but this only happens if the traveler is discerning enough to select the right cruise. We’ve told stories before about why we’re not loyal to one cruise line, and our most recent trip only supported our discerning approach to seeing the world via cruise ships (although to be truthful, it is certainly not the only way we travel). The most recent experience that supports our continuing adherence to this policy started one beautiful day in Papeete, Tahiti about seven weeks ago. We have been on beautiful ships before – the Queen Mary 2 comes immediately to mind – but the Oceania Marina was something else again. And the cruise line itself was a brilliant ‘find.’ The trip really didn’t start there, though. It actually began last winter in St. Martin where we ended a Caribbean cruise on the Seabourn Spirit. 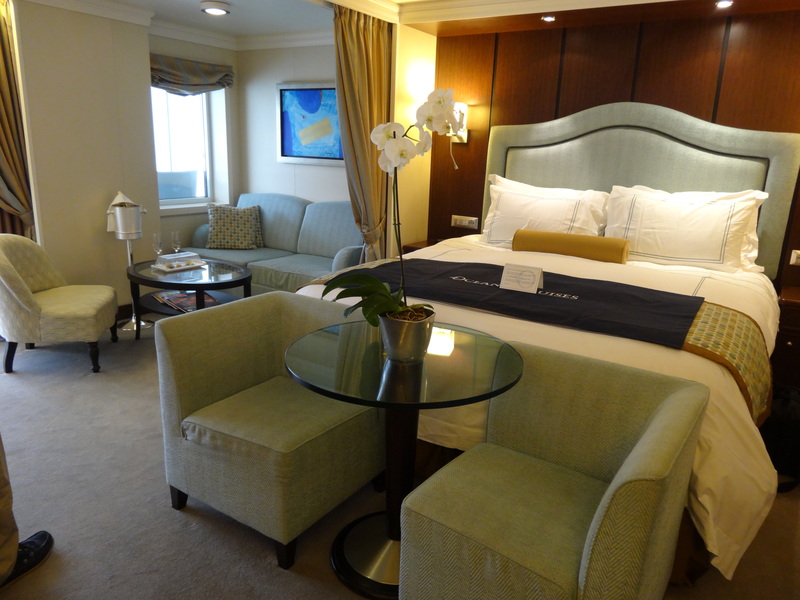 The Seabourn cruise – a luxurious experience to top the list – was certainly at the top of our list until last month, but it was because of the Seabourn experience that we even ended up on Oceania. With only four ships and ten years of cruise-line experience, Oceania hadn’t even appeared on our travel radar. It wasn’t until we were having dinner one evening on the French side of St. Martin when our dinner companions, an American couple who had just disembarked from the Seabourn ship at the same time we did, asked us if we’d ever tried Oceania. Given that they had just stepped off a 204-passenger, ultra-luxury ship that had impressed all of us with their guest service and attention to detail, and yet they were recommending another line, it seemed that we should listen to them. So, months later when we were examining itineraries for this winter, we happened upon Oceania’s and decided that since it fit our requirements, we’d book. Our only hesitation was that the ship would have 1200 guests, a worrisome increase in numbers. We did know, though, that the amenities offered in a larger ship might offset our apprehension about the larger numbers ( it has to be mentioned here that we would never even consider a ship with more than about 2000 passengers and the closer to 500 the better). It’s difficult to truly capture the elegant sophistication of the décor and ambience of the Marina in a few words. Our brief video tour might do it more justice. In spite of our delight in dressing up over the years, we seem to have evolved to a point where taking gowns and tuxedos on long holidays is losing its luster. But the truth is that on mainstream cruise lines, people actually do behave better when they’re dressed up a bit. We weren’t sure what to make of the “country club casual” dress code before we left. Surely ‘country club’ means different things depending on where you’re from and whether or not you’ve actually ever been to a country club. To their credit, the passengers on the Marina were by and large beautifully dressed. In the evenings, although there was no requirement to dress up, the vast majority of passengers did step it up and present themselves elegantly – if a bit more casually than you might see on the Queen Mary. We were very happy with the ambience. Our Penthouse suite was, from our previous experiences, a bit tight. At 420 square feet (we believe that must include the verandah), it should have been large enough. The 376 sq. ft. Penthouse on Regent’s Mariner seemed more spacious. We have concluded it has to do with the excessive amount of furniture that makes it feel tight. But well-appointed it was. In fact, it was probably the prettiest suite we’ve ever been in (we can’t compare it in size to some of the others since many of them were in higher categories). The penthouse suite was beautifully appointed, if stuffed with furniture. Other highlights of this cruise were the staff (to a person they were smiling, friendly, guest-oriented, and efficient), the dining (possibly the best we’ve ever experienced at sea) and the onboard culinary institute. We registered in advance for three two-hour cooking classes in their state-of-the-art teaching kitchen and found it to be the best organized, most interesting and informative activity on a cruise ship. And Oceania is the only line that has this on two of its ships. Other lines offer cooking demonstrations, but Oceania offers much more. These classes on the Marina, accommodating only 24 guests at a time, were hands-on classes. We came home with some wonderful new recipes and several new technical skills. Our only complaint was about the evening entertainment. It seemed to be geared to the over-eighty crowd. The potential in the musicians was there, but when they mechanically launched into “The Tennessee Waltz” we wondered when the nurses would be around with the medications! A little tweak there and it just might be the perfect cruise line for the discerning travelers among us! Of course, the real highlight of the trip was the travel part – to parts of the South Pacific that we thought we might never see. Put Bora Bora on your bucket list and come along with us next week as we take you to the top of the volcano in the center of the island.